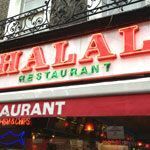 Halal of Marble Arch is an Egyptian Restaurant specialising in traditional regional dishes and halal meats. Outside dining on the pavement area is available. Do you work at Halal of Marble Arch? What did you think of Halal of Marble Arch? Egypt – best known for pyramids, heat waves and a really long river. Not, funnily enough, its cuisine. So why Halal of Marble Arch decided to serve traditional Egyptian cuisine is beyond me. The staff at Halal of Marble Arch were nice enough, but a few friendly smiles do not a good meal make. Sorry chaps.